The incomplete contracts literature often cites indescribable contingencies as a major obstacle to the creation of complete contracts. 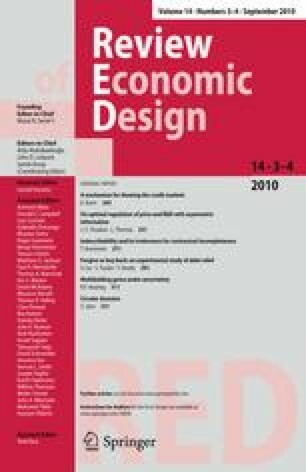 Using agents’ minimum foresight concerning possible future payoffs, Maskin and Tirole (Rev Econ Stud 66:83–114, 1999) show that indescribability does not matter for contractual incompleteness as long as there is symmetric information at both the contracting stage and the trading stage. This is called the irrelevance theorem. The following generalization of the irrelevance theorem is shown here: indescribability does not matter even in the presence of asymmetric information at the trading stage, as long as there is symmetric information at the contracting stage. This is an important clarification because Kunimoto (Econ Lett 99:367–370, 2008) shows that indescribability can matter if there is asymmetric information at both stages. It is thus argued that asymmetric information at the contracting stage is necessary for indescribability to be important in the rational agents contracting model. The main idea of this paper is based on Chapter 4 of my Ph.D thesis submitted to Brown University. I am deeply indebted to Herakles Polemarchakis, Roberto Serrano, and Rajiv Vohra for their generous support, advice, and encouragement. I am thankful to the associate editor and anonymous referees for the comments that improved the exposition of the paper. Seminar Audiences at Brown University, Doshisha University, McGill University, Penn State University, Tokyo Institute of Technology, and Waseda University also had useful suggestions. All remaining errors are my own. I gratefully acknowledge financial support from NSF grant SES-0133113, FQRSC, SSHRC of Canada, Brown University through the Ehrlich Foundation and the Stephen Robert Dissertation Fellowship, and McGill University through the startup grant and the James McGill Professor fund.